73.1250" TTT, Barbie Doll is sired by 77" TTT, Simba, a son of 88"+ TTT Top Caliber and 98.3750" TTT, RM Miss Kitty, and grandson of 78" TTT, Hunts Command Respect, 70" TTT, Hashbrown, 73.50" TTT, 103" TH, Gun Smoke, and 78"+ TTT, Phenomenon's Classy Lady. Barbie Doll's dam is 74.50" TTT, Pacific Barbie, who is a daughter of 73" TTT, Pacific Martha, and granddaughter of the awesome twist cow, 78"+ TTT, SR Dixie Cherry. 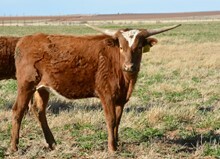 Top genetics for an all around longhorn; awesome color, nice size and conformation, nice horn set and easy to work. Millennium Futurity eligible as will be her offspring.